Wigan Warriors players accounted for 16 of Swinton Lions' points in their 33-26 Championship win at Barrow yesterday. 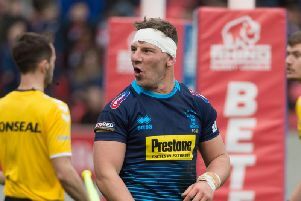 Centre Liam Forsyth scored two tries and fellow Warrior Liam Paisley also crossed, in a match that also featured Chris Hankinson on dual-registration. England academy halfback Harry Smith, who is on loan with the Lions, kicked two of their four goals. Samy Kibula, on loan at Dewsbury, crossed for a try in their 32-22 win at Featherstone. Josh Woods - on a season long loan at Leigh - partnered St Helens' Danny Richardson at halfback in their 26-12 loss at Bradford. Former Warriors Stefan Marsh, Iain Thornley, Tom Spencer and Jack Higginson also played for the Centurions.